No one gives a ****** man. He's a disability. Only poor Chinese ppl care. 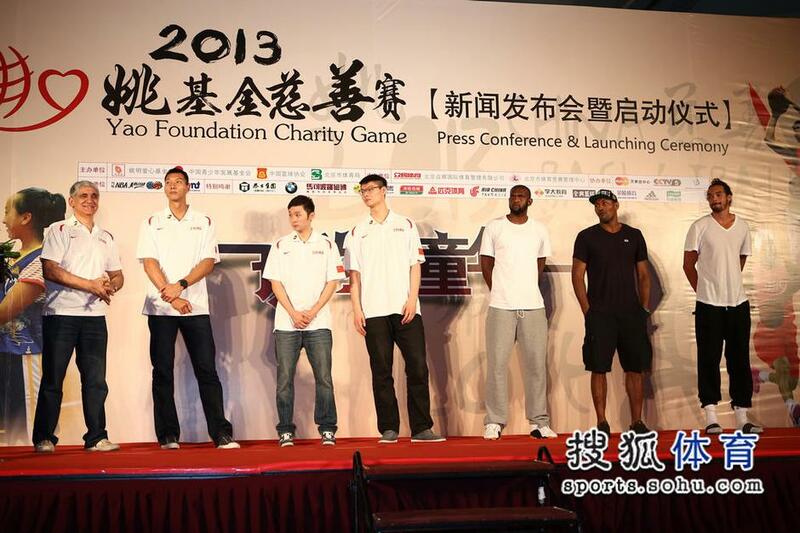 Another former Houston Rockets and team mate of Yao Ming had committed to join the 2013 Yao Foundation Charity Game. It is NO ONE OTHER THAN Tracy McGrady !!! 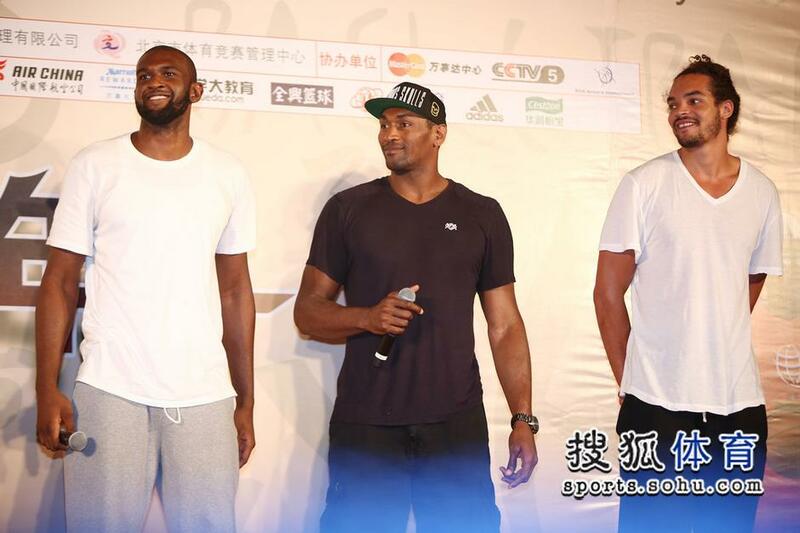 Tracy McGrady is currently on a roadshow with a bunch of NBA has-been/wash-ups (Gary Payton, Bonzi Wells, Jason Williams) in an exhibition series with Bayi Rockets in cities of Chengdu, Shenzhen, Wuxi and Changsha. The series is now 1 ~ 1. The so-called NBA Superstar team lost their debut in Chengdu (119 ~ 115), but won their second encounter 77 ~ 74 in Shenzhen, against a depleted Bayi Rockets that is without 2 of their core players, Wang Zhizhi and Zhang Bo. Another NBA player committed to play for the 2013 Yao Foundation Charity Game !!! And he is Washington Wizards' Chris Singleton !!! I just wish I'm that bespectacled lucky fella in Beijing. 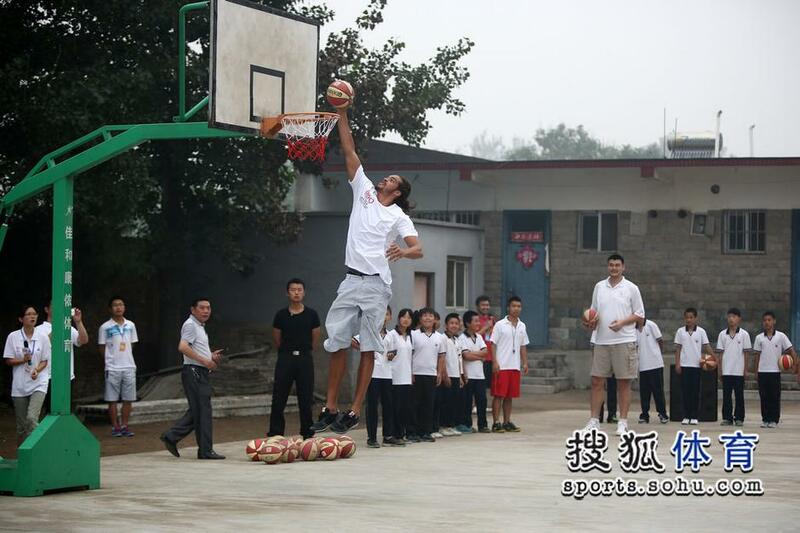 The young man is a basketball fan and used to idolize Yao Ming. He bought a ticket for the Yao Foundation Charity Game over the Internet and won a lucky draw/top prize: that his ticket would be personally delivered to home by NO ONE OTHER THAN Yao Ming himself. So on June 27 (Thursday) evening, Yao Ming acted as a DHL guy to hand deliver the ticket to this fan's home in Beijing. His fan was overjoyed to see him, and Yao Ming stayed awhile, casually chatted and watched a basketball game of the Chinese Olympians (a younger version of the senior Chinese national team) on CCTV5 together with his fan (and fans and family). And yesterday evening Yao Ming hosted a press conference and launching ceremony for his 2013 Yao Foundation Charity Game at the Marriott hotel in Beijing together with representatives from both teams. The China National Team was represented by their head coach Panagiotis Giannakis, Liu Wei, Yi Jianlian and Wang Zhelin. The Yao Team was represented by Joakim Noah, Metta World Peace aka Ron Artest and Chris Singleton (as Luis Scola, Kyle Lowry, George Hill and Tracy McGrady have yet to arrive). 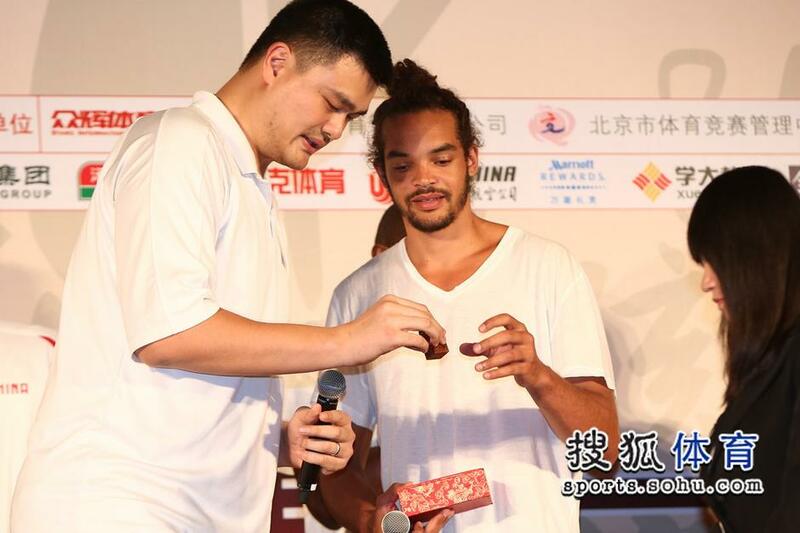 All the players were given a personal signature chop (made of jade stone) with their name on it, and they're asked to chop/sign on the banner with the slogan 以体育人 (which literally means Let's educate others through sports) on it, gifted to Yao Foundation by famous Chinese calligrapher Han Meilin 韩美林. Photos at last night's Press Conference and Launching Ceremony for 2013 Yao Foundation Charity Game at the Marriott hotel in Beijing . 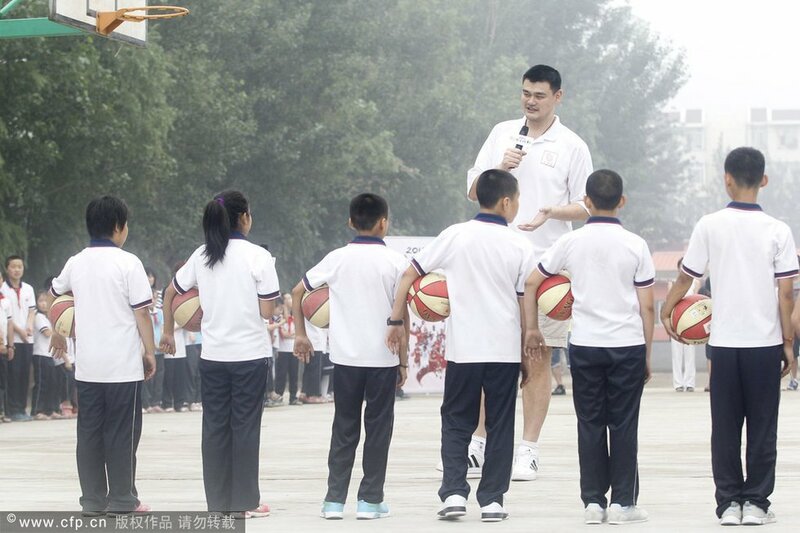 Accompanied by Joakim Noah, Yao Ming went to Changping District Huilei Project Hope Primary School in the suburbs outside of Beijing this morning for a NBA Care alike activity for all the school kids (children of migrant workers in Beijing) there. They taught the school kids there how to do layups. 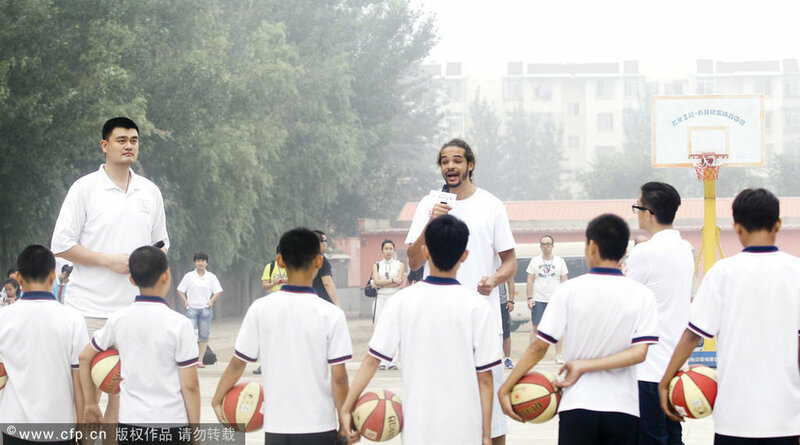 He and Joakim Noah each organized a team of school kids and started competing whose team made the most layups. 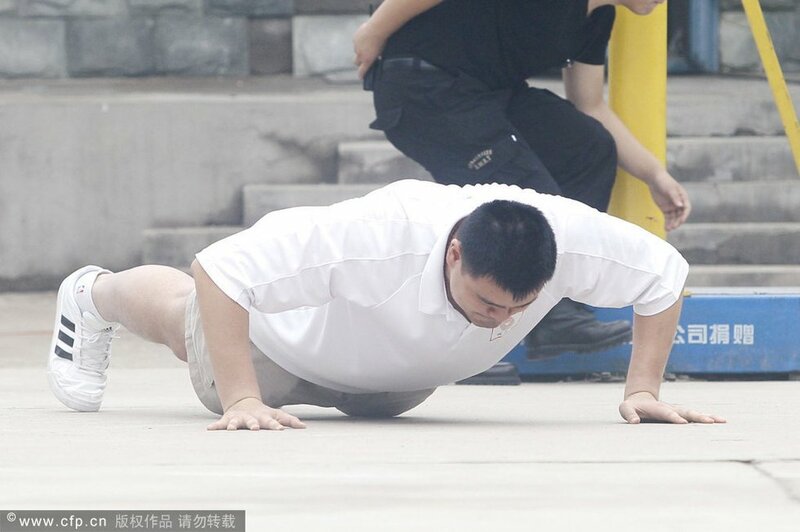 Yao Ming's team lost, and Yao Ming was penalized to do push-ups. They then exchanged gifts with the school principal and took group photos with the school children. Here are some of the photos of the NBA Care activity this morning. 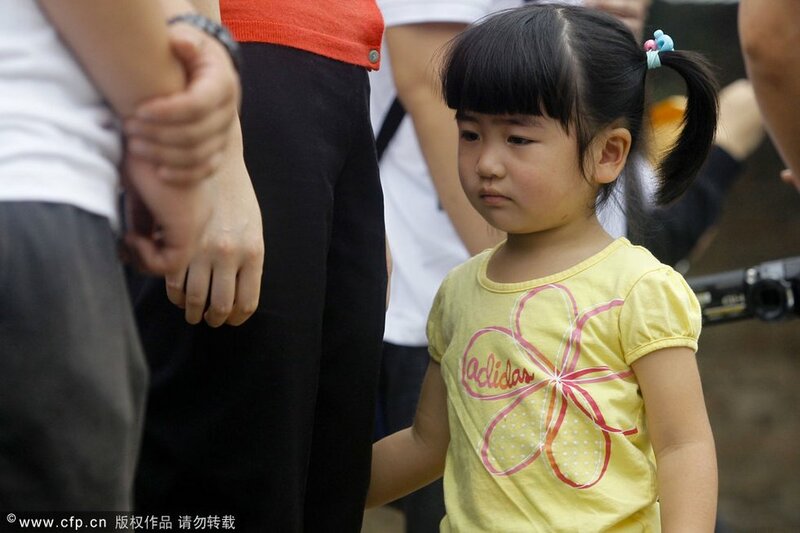 And in today's NBA Care activity at the Project Hope primary school of the children of migrant workers, Yao Ming brought along his whole family (Wife: Ye Li and Daughter: Amy). Here are photos of the cute and chubby Little Amy looking on from the sideline cheering for her Dad. Thanks for the posts, Pryuen. 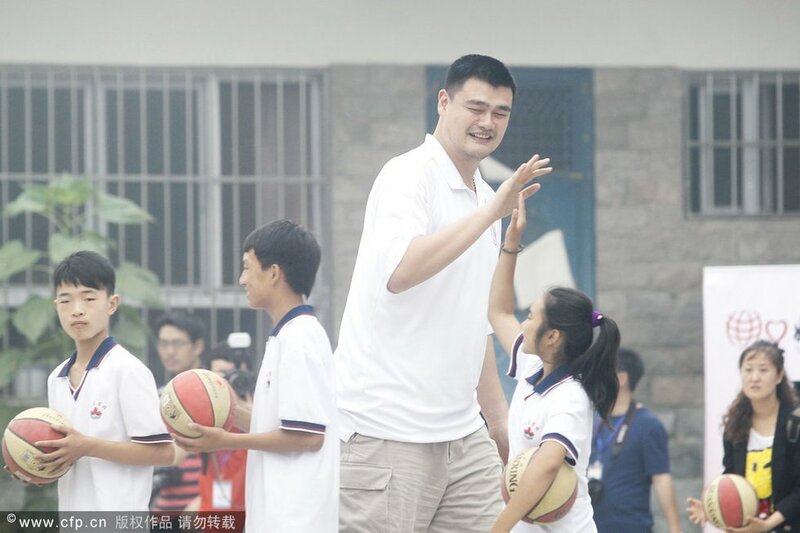 That must have been amazing for the fan to have Yao show up at his home. My daughter is certainly prettier than Yao's, LOL.